Undoubtedly the lathi-charge on female students of Benares Hindu University by policemen on Saturday night was a wrong step and it needs to be condemned. 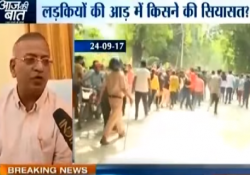 The UP government has done the right thing in transferring three magistrates and two police officials after the incident. But we are yet to get the answer to the question: if there were anti-social elements, how did they enter the BHU campus? If you look at the sprawling BHU campus, you will find a hospital functioning inside, with roads open and no bar on entry of outsiders into the campus. Any outsider can enter the campus and create a ruckus leading to law and order problems. Such things happened in the past too. The Vice-Chancellor cannot escape the blame by saying that he was helpless. A prestigious university like the BHU must have a quiet campus located in an isolated area. That will be the biggest guarantee of safety for students studying there.